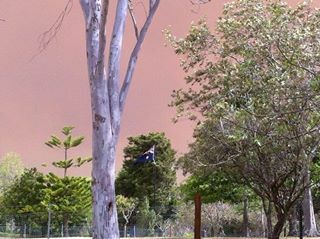 The Australian Flag flying proudly against a backdrop that threatens a terrifying summer. 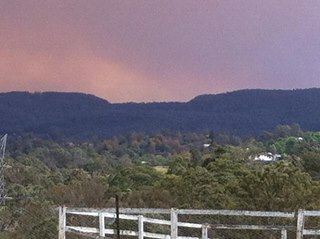 My home is one of the many that lies on the projected fire path of the State Mine bushfire that is currently blazing a devastating trail through the Blue Mountains. We are watching the Rural Fire Service updates and we’ve cleared the leaves out of our gutters and we’ve kept the ground around our house moist. 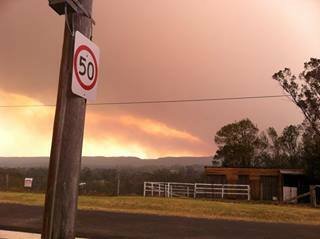 At present we don’t need to evacuate, but we may have to with very little notice… all we can do is watch, and wait, and try to fit as much normal life into the gaps in between the half-hourly bushfire updates on our local radio station. The colour of the flames reflecting from just over the horizon. Huh? The sky is BLUE, you say? Not here in the Mountains. Apricot is the new blue. Our gratitude goes out to the many volunteer and career fire fighters who are trying to contain these threats to our homes. Also to the many wonderful volunteers helping victims and running evacuation centres. His Holiness Pope Francis has asked me to express his concern for the people of New South Wales and all who are affected the devastation wrought by the extensive fires in the region. He prays especially for those who have died and for those who have lost their homes and workplaces, as well as for the numerous personnel working to combat the fires and provide comfort and care for those who are suffering. Invoking the spiritual gifts of solidarity and perseverance upon the communities touched by these trying events, the Holy Father sends his blessing. The billowing smoke on its approach as it settles over the Mountains like a pall. The photographs included here were taken last Thursday from the vantage point of my front yard. This was just the beginning. 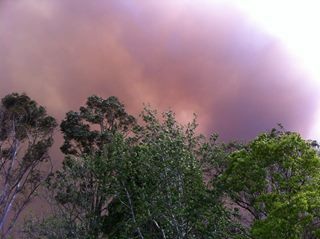 The angry sun, the apricot glow and the smokey haze have all intensified as the situation has worsened. Please pray for all those who are affected by this disaster! The wide brown land for me. 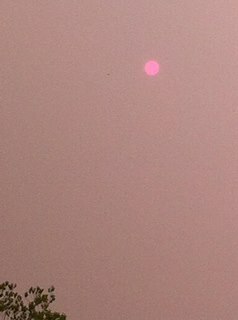 The Angry Sun: Fluorescent Pink! 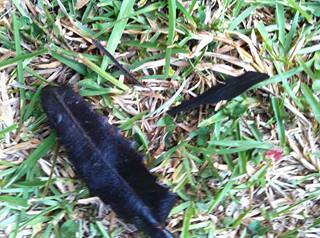 Burnt leaves and ash have been falling in the yard. Categories: Australia, life | Tags: Australia, bushfires, Rural Fire Service, State Mine fire near Lithgow | Permalink. I was on retreat this weekend. I switched my phone off, I left my laptop at home – I voluntarily disengaged from all news and contact with the outside world for 2 short but precious days of silence, prayer, and growth. As I read the observations reported of what transpired in Melbourne during the annual March for Babies, I have to admit that as disgusted as I was, I wasn’t really all that surprised. This behaviour is GENTLE compared with the murderous practices for which these people are campaigning. Fanatical feminists attacking women whose opinions differ from their own; socialists denying the right of ordinary people to rally against oppression… it is no wonder that the journalist reporting felt the need to conclude that the left in Australia is the “natural home of the totalitarian and the bully.” That is precisely what we are seeing here. Let it be understood that I am not promoting the right side of politics in Australia either. Both extremes are far from perfect and both hold unconscionable views on a range of issues of ethical import. On the issue of abortion, however, the ideological opposition to truth, goodness and beauty does appear to have its primary thrust from the left. Categories: Australia, culture, evil, internet, life, politics, secular culture | Permalink. There are some in Australia right now who mourn the end of an era of government. I am NOT among them, and look forward with (measured) hope to better times under the new Coalition government, even if my own electorate is stuck with a member of the opposition holding our seat. I intend to be an active constituent and make her work for the right to be there, put it that way. As far as I can tell, she is not on EMILY’s List, and that is encouraging, at least. But really… lets put things in perspective. It truly IS the end of an era… because THE BEATLES GRAFFITI WALL has been knocked down!! Since 2002 I’ve enjoyed it each morning that I’ve passed it on the roads. And now its gone! Add it to the list of Great Beatles Sites that No Longer Exist. Some walls simply have to come down. The Berlin Wall – it had to go. But really? The harmless Beatles wall that lent such delight to the morning commute? Categories: Australia, EMILY's List, politics, Tony Abbott, urban art | Tags: The Beatles | Permalink. Is freedom of religion in Australia a thing of the past? I’m currently looking for work. The part-time role that I have been covering since I returned from the convent is about to come to a close; it was only ever a temporary arrangement and I’m nearing the end of it, and trying to look for an alternative to move into when this one has finished. I wanted to reach out to you to introduce myself and ask a few questions to learn a bit more about you and see if we can match what you’re looking for. Were you seeking Part-Time or Full-Time position with us, and what days would you be able to work? Please note our Part-Time requirements are at least four full days of availability, including full availability over the weekend. Our Full-Time requirements are seven full days of availability. This organisation requires availability ALL DAY on both Saturday and Sunday.What about people from Catholic, Jewish, Seventh Day Adventist and various other denominations of Christianity or other faiths that entail obligatory worship on either Saturday or Sunday? We are committed to diversity. <COMPANY NAME> are an Equal Opportunity Employer. That sounds like they’re committed to diversity so long as you are prepared to waive your right to freedom of worship. I’ve noticed that most organisations in the Retail industry are imposing similar availability requirements as a matter of policy. This sounds like institutionalised religious discrimination to me. Having spent 24 hours considering all of this (and fuming over it!) I realise that the odds of getting any momentum behind an effort to do anything about this in any serious way is zero to none.And so this particular post remains a soapbox rant. Nothing more. Seriously, though – am I the only one tired of a society where this sort of thing is OK? Categories: Australia, culture, freedom, justice, life, secular culture | Tags: diversity, employment, equal opportunity, freedom of worship, justice, legal, legal protection, religious discrimination, secularization | Permalink. Among the 200,000 pilgrims that attended the Inaugural Mass of Pope Francis in St. Peter’s Square on the Feast of St. Joseph were a small group of Australians who attended as representatives of the young adult community. One of them was my brother, a recent law graduate from the University of Notre Dame, Sydney. lawGrad had the distinguished privilege of carrying the Australian flag at the Mass, and it turns out that this flag was the biggest flag from any nation to appear in St. Peter’s Square that day! This was not a deliberate thing, but it turned out to be a fortunate thing for me, for it obviously attracted a great deal of media attention and as such I was able to watch my brother on news broadcasts even though he was half a world away! Australian Catholics had more representation at the Mass than was perhaps widely known. The Deacon who retrieved the Fisherman’s ring from the tomb of St. Peter and presented it to the Holy Father is a seminarian of the Archdiocese of Sydney. In fine voice, the Deacon also sang the liturgical instructions and the general intercessions. Striking in his humility, the Deacon later insisted on social media that the highlight of the Mass was receiving the Eucharist from the hands of the Vicar of Christ. Proud to be Aussie, proud to be Catholic… yet humble in Christ. This is the picture that our Australian representatives in Rome have painted. A similarly strong sense of identity, side by side with humility, shines forth from the Holy Father’s papal motto, “Lowly, yet chosen.” Building upon this theme in the homily of his Inaugural Mass, Pope Francis called upon those who hold positions of responsibility in economic, political and social life to exercise an authentic leadership that is tempered with the humility, the goodness and the tenderness so crucial to the vocation of ‘Protector’ as exemplified by St. Joseph. The words of Pope Francis should give great hope to Catholics in Australia. We are not wrong in looking to our bishops and priests to be protectors. Further, we are called to join them in protecting the elderly, children and the weak in our community, along with the environment in which we live. Categories: Australia, pope, Pope Francis, The Church | Tags: Australian, Australian Flag, humility, lowly yet chosen, Mass, news the pope, papacy, pope, Pope Francis, protector, St Joseph, St Peter's Square, vatican | Permalink. Enter your email address to subscribe and receive a notification each time I post new content. Pursuing a PhD in Theology with a concentration in Old Testament Scripture. I've broken free from the profit-driven, fast-paced world of IT project management which resulted in my slavery to $$$ and professional status for far too long. Am requalifying as a Librarian, and I hope to have completed my Masters of Information Studies in a few months so that I can return my attention to my PhD, with the stability of modest employment to finance my studies. I hold an MA(Theol. St.) from Notre Dame which included a research project critiquing a particular philosophical approach to the problem of evil. I'm passionate about helping others come to know Jesus, and passionate about getting to know Him better each day myself! Writing. Reading. Life. Love. Family. Audio readings from the Bible to help you read it in 365 Days! Where together we stomp the grapes, wait the barrels, and pour the love. Declare love in the morning and truth in the night! Adventures of a Mum. Books, movies and delicious food.